Vjeran Tomic faces the media at court for his trial in Paris. A THIEF NICKNAMED “Spiderman”, who snatched five masterpieces from a top Paris museum, was sentenced to eight years in prison today over one of the biggest art heists in recent years. 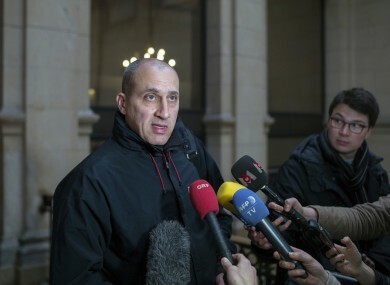 Vjeran Tomic and two accomplices were also jointly fined a whopping €104 million ($110 million) over the theft of the paintings by Henri Matisse, Pablo Picasso, Georges Braque, Fernand Leger and Amedeo Modigliani from the Musee d’Art Moderne on the night of 20 May, 2010. A lawyer representing the City of Paris, which runs the museum, called their disappearance an “unspeakable” loss to humanity. On his arrest he told police he was asked to steal Leger’s “Still Life with Candlestick” from 1922, and never imagined he would be able to grab four more. After grabbing the Leger without creating a disturbance he went on a stealing spree, taking Picasso’s cubist Dove with Green Peas from 1912 – alone worth an estimated €25 million – Matisse’s Pastoral from 1905, Braque’s Olive Tree near Estaque from 1906, and Modigliani’s Woman with a Fan from 1919. An art lover, he had admitted to becoming enraptured with Modigliani’s “Woman with a Fan”. His lawyer had described him as an impressionable man, who was bored with his “nice little bourgeois life”. Tomic, a master burglar, said he took five paintings because he “liked” them. The most recent, in 2015, involved the theft of five paintings worth 25 million euros by renowned Irish-born British artist Francis Bacon in Madrid. Email “'Spiderman' art thief fined €104 million over one of the biggest art heists in recent years”. Feedback on “'Spiderman' art thief fined €104 million over one of the biggest art heists in recent years”.